In 1987, based on the commercial success of both Alan Moore’s run on Saga of the Swamp Thing (#21 - #64) and his collaboration with Dave Gibbons on The Watchmen maxi-series (1986), editor Karen Berger decided to visit the UK and poach some new talent. She managed to recruit writers Neil Gaiman, Jamie Delano, Grant Morrison, and Peter Milligan to team ‘DC comics’. This is what is effectively known as the British Invasion. The goal was to take advantage of the sudden interest in more sophisticated story-telling all the while filling the need for new talent at DC comics (and the American comics industry in general). The British Invasion was instrumental in the creation of the Vertigo imprint. I consider Skreemer to be a Vertigo title (even though Vertigo didn’t officially exist until 1993). b) was it edited by Karen Berger? c) did it carry a 'Mature Readers’ label? If you can answer 'yes’ to most of these, it was probably one of the titles that set the stage for the creation of Vertigo. 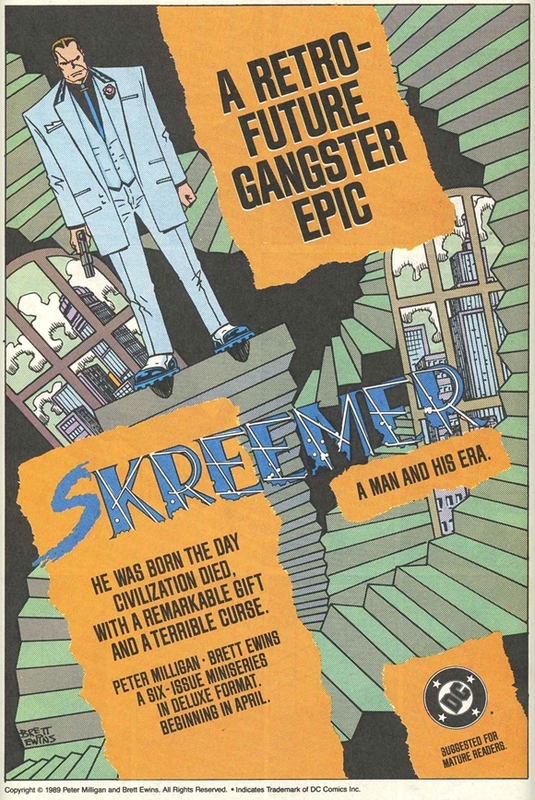 Written by Peter Milligan and illustrated by Bret Ewins, Skreemer is a very interesting blend of the gangster/sci-fi genre set in a dystopian future. Ewins has been quoted that the concept for this mini-series was heavily influenced by the film Once Upon a Time in America. (Observant readers will also notice many references to James Joyce’s Finnegans Wake.) And yes, it was edited by Karen Berger and it has a 'Mature Readers’ label on the cover. Milligan is at the top of his game here. Excellent story-telling and use of flashbacks to establish pacing. Explores various themes such as pre-determinism vs free will, and family obligations vs personal morals and ethics. A truly excellent mini-series and I recommend reading it all in one sitting to truly get the full impact of it. Unfortunately, in 1989, this series did not sell well — probably because it was completely disjointed from the current DC universe and it had to compete with a flood of other titles on the marketplace. However, during the same year, it DID win an Eagle Award for Favorite Single or Continued Story in the US. In 2002, the first issue was offered as a black and white promotion for Free Comic Book Day (meant to entice readers to buy the full-color TPB reprint from Vertigo comics published that same year). Because good talent never dies (it just gets shuffled around): Milligan went on to write Shade, the Changing Man for Vertigo comics in 1990 (which became one of Vertigo’s flagship titles). If you're interested in reading about the British Invasion, I'd eagerly recommend Sequart's The British Invasion: Alan Moore, Neil Gaiman, Grant Morrison, and the Invention of the Modern Comic Book Writer by Greg Carpenter. It goes into extensive detail about the early careers of Moore, Gaiman and Morrison and why they had such a profound impact on American comic books. There's also a really good interview with Karen Berger. Read the review here.